The MP3 Junior is a new class of power wheelchair. 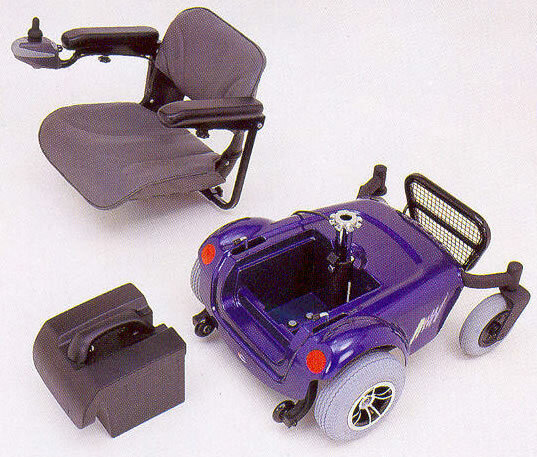 This chair breaks down into three easy to manage components: base, seat and battery. With the heaviest piece weighing only 58 lbs., this chair is ideal for travel by auto, train, bus, etc. The MP3 Junior is an Insurance billable item. One of the great features of the Junior is the quick release battery box, that allows the user to fold the base (without the battery) and roll it along easily, like a suitcase. The removable battery pack can be charged separately from the chair itself. This allows the user to leave everything except the charger in storage when the unit needs to be charged. This unit is designed for optimum maneuverability and portability, yet has a weight capacity of 250 lbs. The junior has a very tight turning radius of 19" and will maneuver well in the tightest spaces. Heaviest Piece Weighs ONLY 58 Lbs.!!! Easily stores in small car trunks and RV storage compartments!! Unplug controller from base and remove seat: Only 21 lbs. Simply lift out battery pack (no wires to disconnect): Only 33 lbs. Base remains in one easy to handle section: Only 58 lbs. This unit will fit easily in the back seat or the trunk of small vehicles. Variable speed control up to 4.5 mph. Small, portable, removable battery pack to allow separate charging from the base. The 19 inch turning radius makes the Ruby turn on a dime! Foam filled tires are standard. Billable to most Insurance companies. 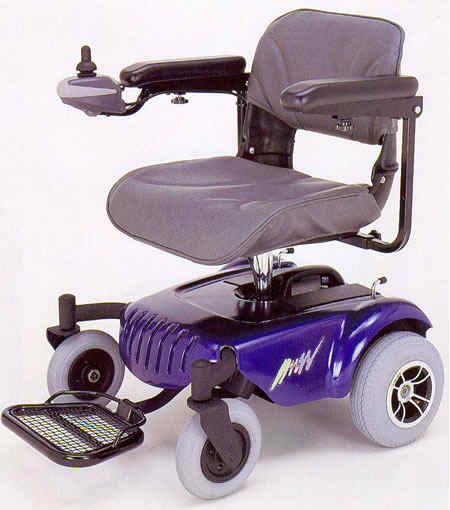 Seat Height to Floor 18" to 20"
Light weight portable design, easily detachable seat and quick release battery. Disassembles into 3 easy to store and handle pieces, with the heaviest piece weighing only 58 lbs.!!! 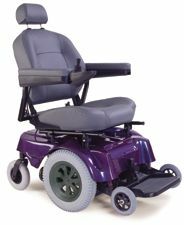 Small base frame makes this chair ideal for maneuverability in confined living spaces. Affordability and transportability make the MP3 Junior Ideal for people on the move! Per-charge Range Up to 12.5 miles. Weight of heaviest piece - ONLY 58 lbs.